A fascinating exploration of a primal human emotion, from its neurological basis to its impact on society. 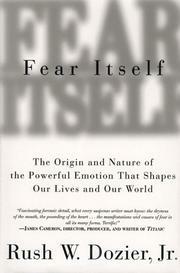 Science writer Dozier (Codes of Evolution, not reviewed) examines the evolutionary beginnings of fear and describes what neuroscience has learned about the three interconnected systems in the brain that process it: the primitive fear system, centered in the limbic system; the rational fear system, occupying the frontal lobes of the cerebral cortex; and consciousness itself. The first acts as an alarm, triggering a fight-or-flight response that can lead to panic or violence; when this system misfires, phobias, anxieties, and even psychopathic disorders may result. In one dramatic example, Dozier illustrates the three systems interacting smoothly in a crisis, enabling certain people to behave in such a way as to survive a deadly plane crash. No other species, he claims, feels the fears of human beings or has worked so hard to suppress or control these. Fear of the unknown and fear of death, for example, have together given us religion. Overcoming the fear of fire has transformed human life and led to —civilization.— Dozier ranges widely and illustrates vividly, taking up the origin of such common phobias as fear of snakes, spiders, and heights, the special fears of childhood (the dark, monsters under the bed, etc. ), the prominence of fear-related stories in the media, and the pleasures of facing and surmounting fear on, say, a roller coaster. While the neurological discussions of brain anatomy and function occasionally become a trifle technical, Dozier’s anecdotal material about fear is memorable, and his speculations are provocative.